Learning to read CVC words is such a necessary skill and exciting time for emergent readers. Nonsense words give those readers a chance to actually think about what they are reading, for the first time. 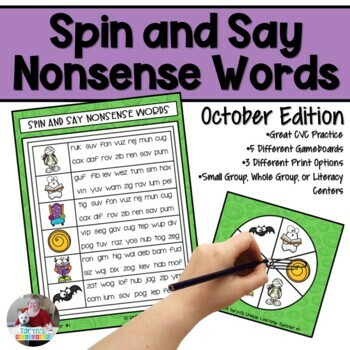 This October Nonsense Words Spin and Say product is the perfect combination of these two skills- reading and thinking! Included with this product you will find five different game boards and corresponding spinners. These game boards come with three different printing options: full color with a green background, color with a white background, and black line for saving that valuable ink in your printer cartridge. You can copy the black line on purple, green or orange Astrobrights paper for a pop of color without using up your ink! To play, simply print the game board selection of your choosing along with the matching spinners. Students can use a paperclip as a spinner along with a pencil or you can use an attachable spinner or a plastic spinner overlay. Students spin the spinner and note the picture on which it lands. Find the matching picture on corresponding game board, and read the nonsense words located in the box beside that picture. READ AWAY! This is wonderful practice for DIBELS or Aimsweb assessments and reading in general. Thanks so much for your interest in my products. Be sure to follow my store by clicking on the star at the top of the page. You will be kept up to date on revisions to previously purchased products as well as notification of new products added to my store. Also, don't forget to follow me on Facebook or Instagram to see the latest happenings in my Intervention Classroom/Office.